Traveling back over 100 years of automotive history, this book brings to dazzling life the dawning age of the automobile—a time when the early promise of personal transportation inspired great feats of design and engineering, resulting in some of the most remarkable vehicles the world would ever know. From Detroit and Indianapolis to Paris and Stuttgart, the story of the automobile’s first half-century unfolds on two continents, as automakers and coachbuilders—well-known American names like Cadillac and Chrysler as well as the now-ghostly Duesenberg, Stutz, and Packard; Bentley and Rolls-Royce of England along with the Bugatti and Alfa Romeo of Italy, Delahaye and Delage, Murphy and Saoutchik—create rolling works of art for the world’s wealthiest and most powerful figures. Drawing together more than 20 years of research, interviews with legendary designers, and hundreds of fabulous photographs, author Dennis Adler traces the history of these magnificent machines—more than 100 great cars made for monarchs and presidents, and for stars of stage and screen. 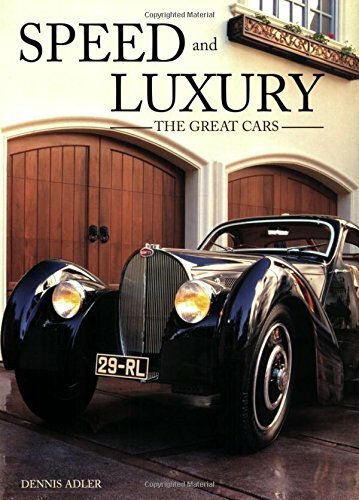 From the first sports and luxury cars built in America and Europe to the last spectacular models to leave the ateliers of France’s most celebrated carrosserie at the onset of World War II, this book tells the story of these great cars with all the artistry and style of their era.